Fairfield, NJ – July 31, 2018 – The National Center for Education Statistics reports that over 70 million students are heading back to school this year. According to last year’s statistics, about 50.7 million were enrolled in pre-Kindergarten – 12th grade and another 20.4 million attended colleges and universities. Long story short…..a good portion of our population is heading back to school! And what they all have in common is, they need a healthy lunch and healthy snacks to keep their neurons sparking and provide the energy required to get through the day. 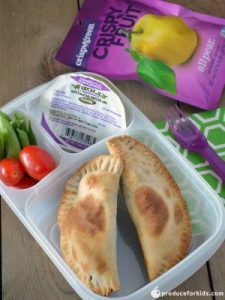 So whether your little one is heading off to school for the first time or you have one going off to college, they will need a nutritious lunch. Crispy Fruit Freeze-dried snacks are the perfect complement to any healthy lunch. For those parents who will be packing their kids’ lunches, Crispy Green is proud to be a sponsor of the 5th annual Power Your Lunchbox campaign from Produce for Kids. This campaign grows every year, with more parents making the promise to pack a healthier lunch for their kids. PYL makes it easy by providing a wide variety of creative and delicious lunch options (you’ll never ever run out of ideas of what to pack!). Plus, you’ll be self-assured that you’re providing a healthful lunch. (AND, for every parent that takes the Power Your Lunchbox Pledge, Produce for Kids will donate $1 to Feeding America!). And even if you’re NOT packing their lunch yourself, make sure they have a bag or two of Crispy Fruit Freeze-dried fruit snacks in their backpacks in case they need a healthy boost. This one-ingredient, no-sugar-added snack will keep them energized. From pre-schooler to grad student, this snack satisfies! The convenience of bringing real fruit that snacks like a chip to school, soccer try-outs, Spanish Club, band practice or any other extra-curricular activity will make it easy for your kiddos to stay away from other, less healthy snacks. This year, make sure you keep school lunches and snacks at the top of your back-to-school checklist. It’s truly as important as registration, shopping for school supplies and new school clothes, and making sure the kids are up to date with their vaccines. A little pre-planning before the night before the first day will ensure your kids start the year with a healthy lunch and nutritious snacks to keep them happy and attentive as they get settled into their new routine. 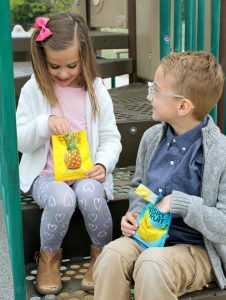 Crispy Fruit freeze-dried fruit snacks are 100% pure fruit that come in convenient single-size serving bags. Delicious, sweet fruit flavor that snacks like a chip. No preservatives, added sugar, oils or fats—JUST FRUIT. And the best part is, kids actually LOVE it. It’s such a welcome alternative to high-sugar, gooey fruit snacks that contain ingredients many kids (and adults) can’t even pronounce. And, with seven fabulous flavors, kids can choose a different flavor every day of the week! Choose from apple, pear, banana, cantaloupe, mango, pineapple and tangerine…something for everyone! All Crispy Fruit flavors are available in a convenient 6-pack – six single-serving bags (MSRP: $7.99) or individual, single-serving “Grab & Go” bags (MSRP: $1.49 each) that provide approximately one serving of fruit and 55 calories or less per bag. And, since Crispy Green is the No. 1 freeze-dried fruit brand at retail, you can be assured you’re purchasing a quality product that other moms, kids and active folks choose most often.